I love Mexican street corn. Lloyd Taco Trucks makes a popular version of the dish known as krazy korn when it’s in season and fans cannot get enough of it. 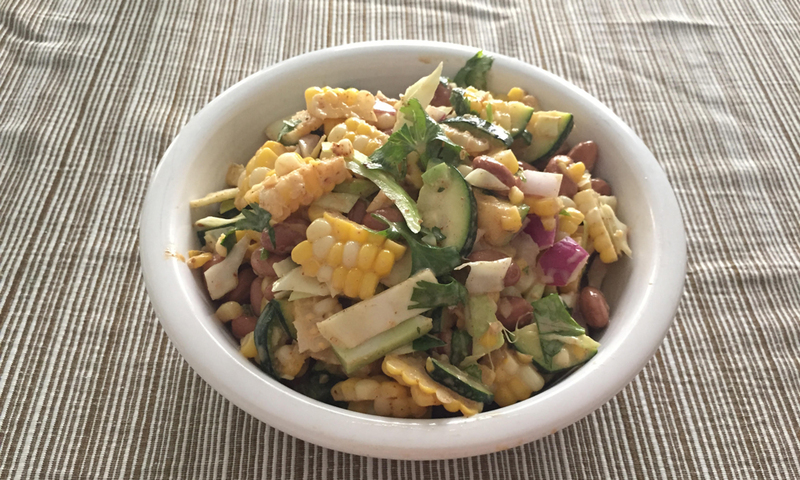 I recently examined my CSA haul and dreamed up a salad using nearly all the ingredients I had in that week’s share: behold this salad, featuring the bounty of late summer vegetables. Cool corn. Meanwhile, sauté zucchini in a small amount of olive oil under tender; set aside to cool. Add all cooled ingredients to a large bowl and mix. Combine mayonnaise, olive oil, apple cider vinegar, lime juice, hot sauce and spices in a separate bowl; whisk to combine. Toss salad with dressing. Add more chili powder, cumin, paprika, cayenne pepper and salt to salad to desired taste. You can easily tweak this salad’s vegetables–use whatever is fresh, what you have on hand or what you like best. It shouldn’t be too complicated. This is a no (low) fuss meal! Furthermore, feel free to substitute pinto beans for black beans or another bean of your choice. You could even mix it up with adding meat, such as shredded pork or ground beef. Lastly, this salad has a lovely aroma and flavor, which deepens with time. If you leave it in the refrigerator for a few hours before digging in, it will develop a more robust taste. Play around with the seasonings to bring out the flavors you like most. I came up with this ratio because it’s what I like for seasoned meat when I’m making Mexican food.